When comparing prices on welder generator rentals in Santa Cruz, Gilroy and San Jose, ask about sales tax and environmental fees. Rental rates are based on 8 hours per day 40 hours per week and 160 hours per 4 week's usage. Over Hours, Double and Triple Shift Rates Will Be More. 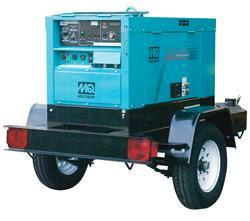 To safely tow this welder generator, A Tool shed requires a vehicle with a rated towing capacity of 3,500 pounds or more. Your hitch must be in good condition and have a rated capacity of 3,500 lbs or more. * Please call us for any questions on our 400 amp arc welder / 14 kw generator rentals in San Jose, Campbell, Salinas, Santa Cruz, Watsonville, Morgan Hill, Hollister, Santa Clara, Gilroy, Milpitas Sunnyvale, Fremont, Salinas, the Greater Bay Area and the Monterey Peninsula.